When you have a bright idea for a new medical device or for an innovative update of an existing one, it can often be a challenge turning it into reality. You may be missing key knowledge, facilities or staff. It might be unclear how best to incorporate important functionalities. Or you may need out-of-the-box thinking to help you make a technology leap. 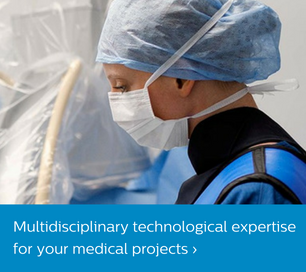 In our medical device development service, you have an expert, multidisciplinary, technical partner that can support your project in every way. How can I get the most out of new technology while de-risking its use in medical device development? Is my medical device design feasible, and does it include – clearly and precisely – exactly the specifications it will need in all of its future development steps? What alternative solutions can help me maximize reliability, minimize cost and still ensure regulatory compliance in my medical device development? Working with us provides you with the insight, infrastructure and hands-on help you need to tackle all these types of issues. 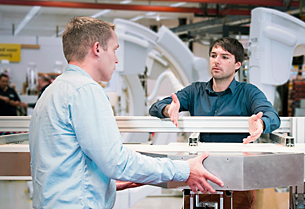 You can also access these resources at any stage of medical device product development – from conceptualization to engineering & design and even small-series production. At each one, the medical device development team helps you make clear definitions and smart choices that protect you from costly mistakes, ensure the desired quality and increase your speed to market. We can deliver services in each of the following medical device product development areas to help your project reach the next milestone. But we are also able to act as a dedicated project partner capable of adding increasing value through every stage of the journey to market. Our system architects capture all input required to create a well-defined medical device design that ensures reliable performance and regulatory compliance. All key angles are covered, from functional and interface requirements to safety standards and a host of other factors such as tolerance, cost & manufacturability, risk management, inspection and traceability. On the basis of gathered input, experts create the necessary documentation to guide engineering team(s) through the concept, development, realization and verification phases. Our medical device prototyping and testing services can be quite valuable in confirming an idea’s feasibility or appeal, comparing different concept functionalities, and eliminating costly mistakes early on. A tangible prototype or functional model also helps teams develop common understanding that leads to more focused cooperation – and better medical device development. We can even put our dedicated professional workshops and manufacturing methods expertise to work to develop custom manufacturing processes for your needs. Design is not just about tailoring a product’s ‘look and feel’ to reflect your brand. It is also about deciding how best to incorporate key functions in a constrained environment. Our engineers work easily in the virtual world to transform completely new medical device or sub-system concepts into proven design principles. CAD is our standard environment, but skilled hand-sketches are also often very useful in evaluating medical device development. Making full use of our Quality by design tools and methodologies, we help your team make important early choices that generate great advantages later in the development chain. At a certain stage in medical product development, designs need to be transformed into testable assemblies. The Philips Innovation Services organization can provide support in component acquisition, supply planning and follow-up to meet the most challenging timelines. If necessary, we can extend our own internal manufacturing capabilities with external partner capacity to ensure cost, quality and schedule targets are met. When all required parts are available, we offer experienced technicians who can assemble them into the required sub- or system assemblies. The medical product development experts will compile test plans to qualify functionality of components and interfaces in order to guarantee speed and quality during commissioning. We provide thorough Medical test & verification services that enable you to prove your medical device design meets the safety standards that regulatory bodies, such as the FDA, CSA, CE, and UL, recognize. We often have customers who require a small quantity of devices to do product validation with end-users. Our in-house, small-series production facilities make it possible to deliver these, saving you the investment of having to tool-up an entire production facility. Philips Innovation Services has decades of experience in every aspect of medical product development. What’s more, our medical device development expertise crosses the entire ‘care continuum’: from devices that facilitate healthy living, to those that enable prevention, diagnosis, treatment, recovery and homecare. This gives us a uniquely holistic insight and approach that has already helped generate great solutions in the fields of health monitoring, connected personal health, hand-held diagnostics, patient recovery systems and smart drug delivery. Whatever your focus area, our engineers and other experts can work with you as individual specialists or in multidisciplinary teams, depending on the maturity of your idea or device – and your needs and wishes.